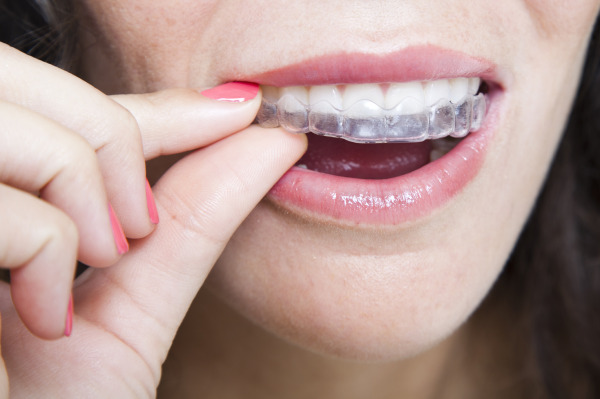 Whether you hope to correct a problematic bite or straighten your teeth solely for cosmetic reasons, Invisalign® orthodontics may be an excellent choice to help you obtain a natural, comfortable smile. Dr. Danielle Marquis and her staff in San Francisco offer professional Invisalign orthodontic services that are sure to fit your needs and lifestyle. One of the most prominent concerns adults have when considering orthodontic work is the appearance of traditional metal braces and the extended period over which the orthodontic work is done. Invisalign alleviates this concern by providing a metal-free, faster-working alternative. Dr. Marquis is experienced in Invisalign orthodontics and can help you take the next step toward achieving the smile of your dreams. Treatment consists of a series of custom-made alignment trays that move the teeth over time. First, you will meet with Dr. Marquis for a consultation and to create an initial treatment plan. She will take three-dimensional images of the entire jaw, allowing her to view different angles and foresee what the teeth and face might look like during and after treatment. Essentially, Invisalign technology will enable her to see how the treatment will affect your facial aesthetics. After an initial plan is complete, Dr. Marquis will create a custom set of alignment trays. The total number of aligners needed varies from patient to patient, but 20-29 sets per arch are common. During the treatment process, Dr. Marquis changes the trays every several weeks to fit your next tooth configuration. Want to Learn More? Visit our San Francisco Invisalign Dentist! Many people are thrilled with both the Invisalign treatment process and the beautiful, long-lasting results. If you think Invisalign is right for you, contact Dr. Danielle Marquis in her San Francisco dental office today or schedule a consultation online!